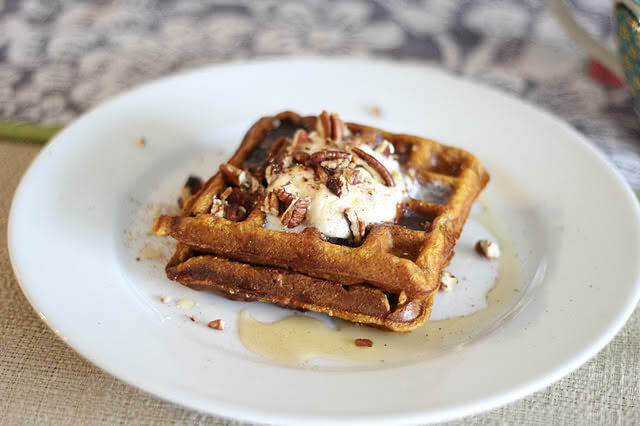 Pumpkin Pie Waffles.. have em for breakfast or a late night MUNCHIE TREAT lol. 1. Preheat waffle iron. If you want to keep your waffles warm until serving time, preheat your oven to 150 F. Melt the butter in a small sauce pan or bowl in the microwave and set aside. 2. In a bowl combine the pumpkin puree with the sugar, pumpkin pie spice, and salt. Mix well. 3. Beat in the egg. Add the milk, yogurt and vanilla and stir with a spatula to combine. It is OK if the mixture is lumpy. 4. Combine the flour with the baking powder and baking soda. I do this right in the measuring cup and give it a little stir. Then add the dry ingredients into the liquid and stir until combined. Fold in the melted butter. 5. I do recommend lightly greasing the plates of your waffle iron with some melted butter. I have never before done this with any other waffle recipe, but these ones are really sticky! Use a large spoon or ice cream scoop to spoon the batter onto your iron, and spread them with a spatula a bit to even them out. They are usually done when the iron stops steaming. Optional Toppings: Whipped cream, toasted nuts, toasted pecans, pure maple syrup and cinnamon. Also goes lovely with a cup of Chai tea too.